Has your Fantasy Football withdrawal kicked in already? Are you already thinking about next year’s draft? Yeah, me too…That’s why I’ll be frequently updating my draft boards on MichaelPiff.com starting next week. We have some awards to hand out from the 2015 season! 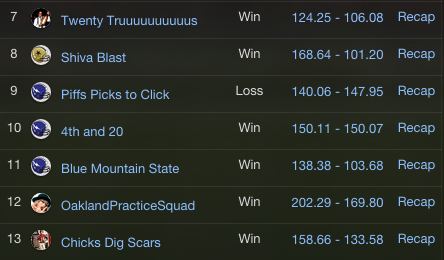 This season was wild. Injuries, suspensions, surprises, Gary Barnidges, backup quarterbacks, drama and more drama…We’ll look at all the impact players, and some of the worst, that dictated your fantasy season this past season. 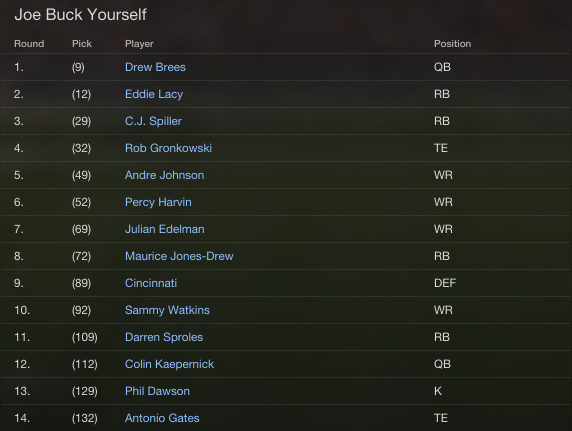 Every year you do your Fantasy draft, who usually goes off the board first?…Running backs. Then someone drafts Aaron Rodgers (probably Andrew Luck this year too) ridiculously high and some wide receivers will round out your first round. Quarterbacks don’t typically start to go in bulk until the 4th round and Cam Newton wasn’t even being considered until the 8th. His average draft position was 77.1 overall, average round was 8.4. 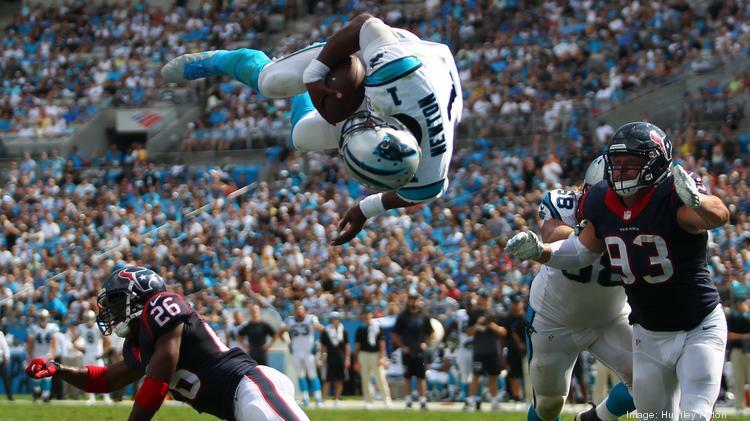 Those who rolled with Newton, and weren’t afraid of the lack of hype around his wide receivers, reaped ALL the benefits of #1 scoring quarterback in football. He finished the season leading the league in total touchdowns with 45 (35 passing, 10 rushing) and added 4,473 yards from scrimmage (3,837 passing, 635 rushing). Newton’s stretch from Week 11-15 (19 total touchdowns) likely helped carry you to your league’s championship too. Hard not to consider Carson Palmer as an MVP as well since he regularly gave you at least 290+ yards and 2-3 touchdowns through the air. I can’t fault players who miss time or underperform due to injury. The top tier of the running backs almost all suffered this, besides Adrian Peterson. 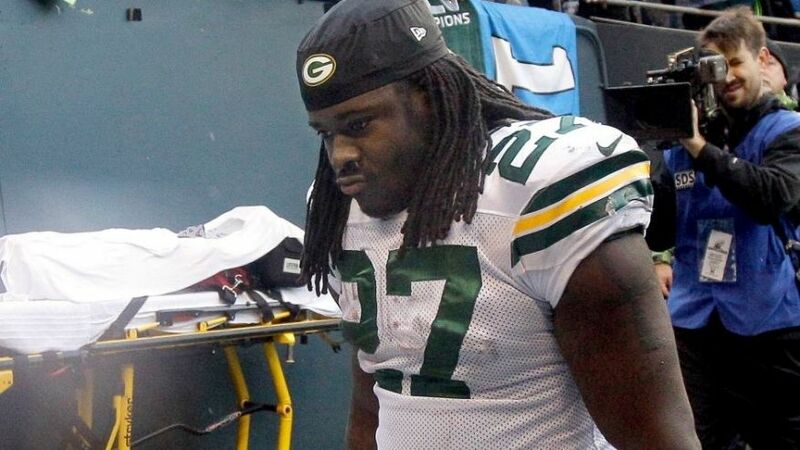 Eddie Lacy wasn’t hurt though. Lacy was a Top 5 pick in most leagues, and he gave you just 3 rushing touchdowns and 758 yards on the ground in 15 games. He was out of shape, missing curfews, and just simply…bad. If any of his 3 games of 100+ yards helped you, I imagine it was because you were desperate at running back. It took Lacy until Week 11 to do so. I’m probably breaking my injury rule here, but you likely picked Bryant late 1st or early 2nd round, held on to him while he was injured, and got just 3 touchdowns and 401 yards in 9 games for your patience. 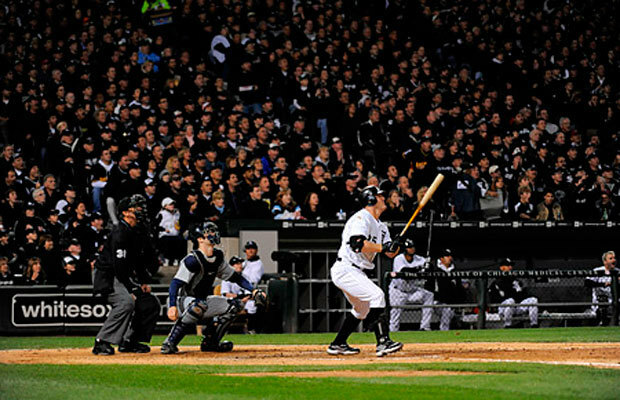 Tony Romo or not, Bryant is supposed to be a game changer…not THAT. 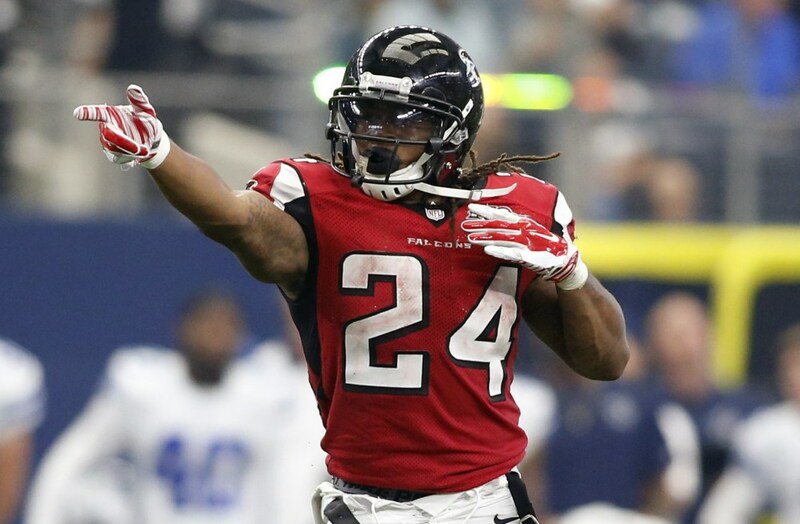 If you paid close attention to the Falcons in the offseason, you were weighing your options of taking rookie Tevin Coleman or 2nd year RB Devonta Freeman as one of your flier picks. If you picked Freeman, you CHOSE WISELY. Freeman went 119th overall on average, 2 rounds or so after Coleman, and he gave you 1,639 yards from scrimmage and 14 total touchdowns (most in the league). He also helped you stack up some wins from Weeks 2-6 with 10 touchdowns (9 rushing, 1 receiving). If you picked Tom Brady before his suspension was lifted, you got him at backup value in later rounds. If you took him after, you still enjoyed his #RevengeTour with 36 touchdowns and only 7 interceptions. 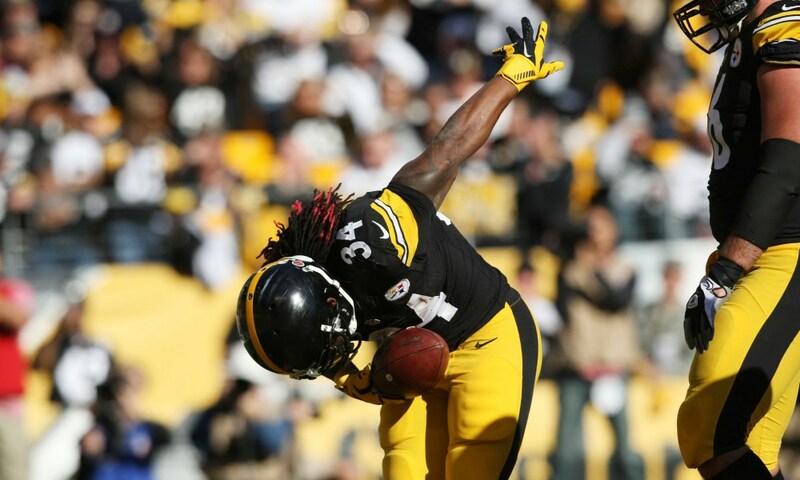 While Le’Veon Bell served his 2 game suspension to start the year, DeAngelo Williams filled in with 204 yards and 3 touchdowns (all in one game). After Bell went on IR following Week 8, Williams gave you high-end RB1 production, averaging 125 yards from scrimmage and finishing tied with Freeman for the league’s lead in rushing TDs. Might gut went with Gary Barnidge initially, but Williams’s value after Bell went down was just too strong…Barnidge was certainly the breakout player of the year, posting 1,043 yards and 9 touchdowns on 79 catches at the age of 30. Before this year, Barnidge’s career totals were 604 yards, 44 catches and 3 touchdowns over 7 years. I’ll admit it. I wrote off the Muscle Hamster. After recording nearly 2,000 yards yards from scrimmage his rookie season, the guy barely hit half of that total over the next 2 years because of injuries, bad offensive lines and worse offensive coordinators. Bucs OC Dirk Koetter figured it all out though and made Doug Martin into the league’s 2nd leading rusher, picking up 1,402 yards on the ground. 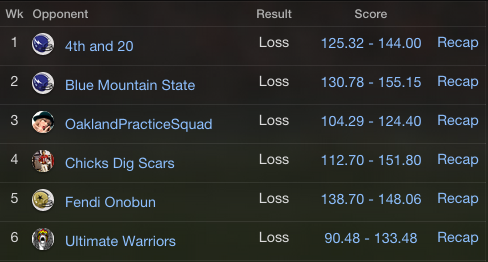 For someone who went in the 9th round on average in most fantasy drafts, I think you’d take that. Ryan Fitzpatrick is the definition of a journeyman quarterback. 6 teams in 10 years, never making the playoffs and a career high of 24 touchdown passes in both the seasons he started all 16 games…until this year. Surround his beard with 2 excellent possession receivers, a quality offensive line, and 2 viable running backs and Fitzpatrick turns into FitzMagic throwing 31 touchdowns. He threw multiple touchdowns in 12 of his 16 starts…Who figured Geno Smith getting punched in the face would benefit them so well? It’s hard not to picture Todd Gurley being drafted in your first round next season. In 12 starts, the rookie out of Georgia 1,106 yards and 10 touchdowns on the ground (2nd highest in the league). Gurley was the Rams’ only source of offense, which explained some of the slow down in production down the stretch as opposing defenses keyed in on him. 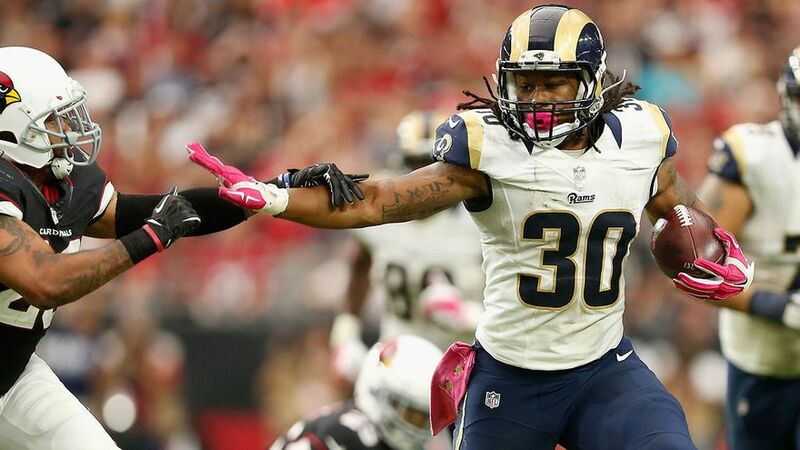 Expect Gurley to just get stronger and scarier now that he’ll have a full offseason without rehabbing an injury. It’s easy to compare Jameis Winston with Marcus Mariota, both rookie QBs with Heisman trophies in their mantles. Winston separated himself from Mariota with big play ability, ranked 2nd in yards per completion (13), and was more consistent for scoring in the 2nd half of the season. Who are your picks for our Year-End Fantasy Awards? Let me know on Facebook or Twitter! Stay tuned for year-round Fantasy Football info for next year’s draft! Feels like just yesterday we were drafting our teams. 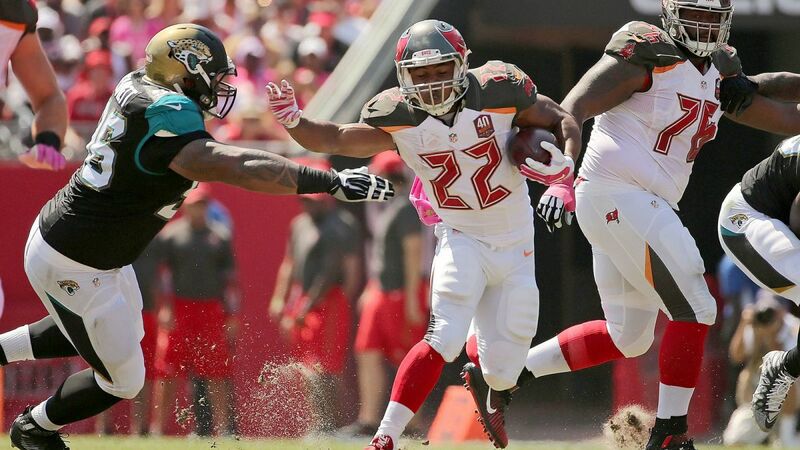 Some of you probably thought you were sneaky, taking Maurice Jones Drew in the late rounds. Others probably couldn’t believe they got Rob Gronkowski in the 4th round. And everybody who drafted Andrew Luck is likely bragging about where they picked him, right? Then you had 13 weeks to tinker and toy with your lineup. Early on, it was adding Steve Smith Sr. for Eric Decker, Dwayne Allen for Jordan Reed, and Justin Forsett for Knowshon Moreno. In October you saw Branden Oliver added for CJ Spiller, Odell Beckham Jr. for Victor Cruz, and Denard Robinson for Adrian Peterson. And when it mattered most down the stretch, CJ Anderson for Ronnie Hillman, Jarvis Landry for Larry Percy Harvin, and Kenny Stills for Larry Fitzgerald. So what do you do to have the edge in the playoffs? You have your players that have been reliable all year and got you where you are, but you can always add help every week. Colts RB – Daniel “Boom” Herron: Even after fumbling twice the last two weeks, the Colts are committed to running with Boom Herron. Herron has picked up where Ahmad Bradshaw left off by making Trent Richardson look sillier and averaging 7.65 yards per carry since Ahmad Bradshaw went on IR. Washington TE – Jordan Reed: I mentioned it a week ago, and I was right. Jordan Reed is a better player when RGIII isn’t throwing to him. Colt McCoy gets the start last Sunday and Reed catches 9 passes on 11 targets for 123 yards. If you’re in need of a tight end or Julius Thomas’s status is making you pull your hair out, pickup Reed. Panthers RB – Jonathan Stewart: DeAngello Williams has a broken hand. Broken hand or not, Jonathan Stewart was running better than Williams anyway. Stewart gained 110 yards total (85 rushing, 25 receiving) against the Vikings defense on Sunday. Even with a 3-8-1 record, the Panthers are in the playoff hunt and establishing some kind of illusion of a run game will be key if they want to steal the horrible NFC South. Colts WR – Donte Moncrief: The word out of Indianapolis is that Donte Moncrief has surpassed Hakeem Nicks for the #3 receiver role. He’s a boom or bust type of player much like Terrance Williams was for Dallas in the first half of the season, but Reggie Wayne’s production is sloping the wrong way. 134 yards and 2 touchdowns on 3 catches last week makes Moncrief very attractive for more Andrew Luck targets and for you to grab him if he’s available. Ryan Fitzpatrick…WHA-HAPPENED? One minute, the “bearded one” was being benched for Ryan Mallett. The next he’s throwing 6 touchdown passes. This is the same Fitz-Beard that averaged an INT per game, and couldn’t find Andre Johnson in the end zone (he did on Sunday). It seems head coach Bill O’Brien has taken off the training wheels finally and airing it out. DeAndre Hopkins had 9 catches for 239 yards and 2 TDs while JJ Watt caught his 3rd off the season. They won’t be playing stats padding Titans again, but they will see the Jaguars this weekend for more air-time. Can we talk about the Rams? They only have 5 wins this year, and really that could have them first in the abysmal NFC South. 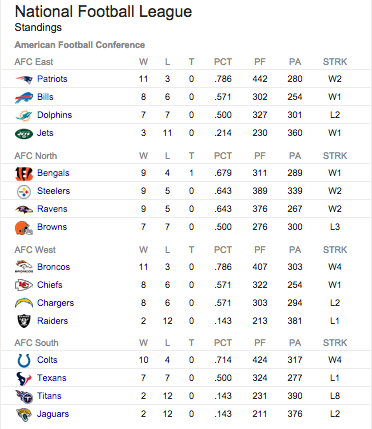 3 of those 5 wins have come against playoff contenders (Broncos, Seahawks, 49ers) and they just beat the Raiders 52-0. 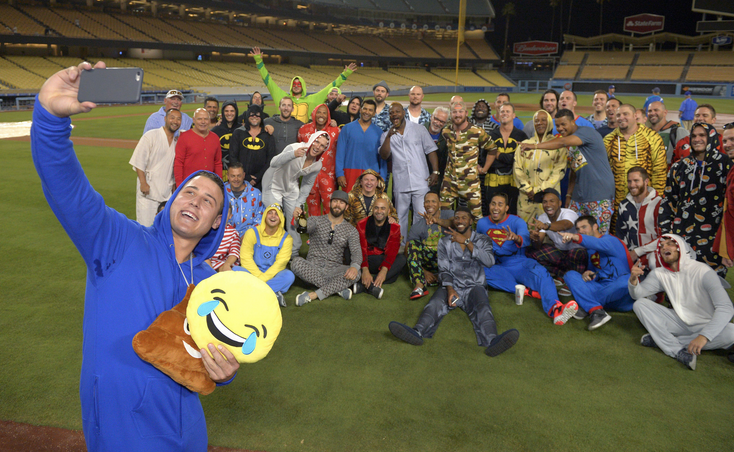 For a team decimated by injuries, they sure don’t act like it. Stedman Bailey (another guy to pick up for your playoff run) has emerged as Shaun Hill’s go-to receiver with 12 catches, 189 yards and a TD on 15 targets the past two weeks. Bailey had 100 yards in the first quarter alone against the Raiders. And Tre Mason just scored 3 touchdowns (2 rush, 1 rec.). He may have just scored again on the Raiders, I’m not sure. And bouncing back from having his winning streak snapped, Tom Brady catapults himself to MVP frontrunner…of commercials. 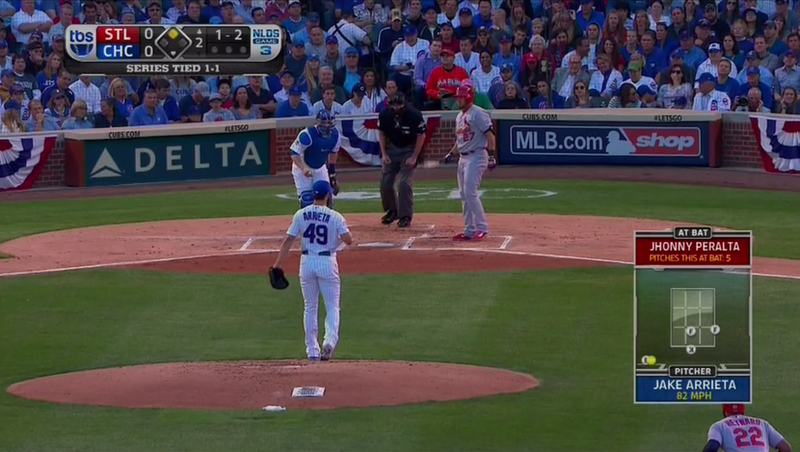 That mullet is…beautiful. And now for YOU time. Normally I lean toward running backs in this situation for guaranteed touches. Before his injury, Gio Bernard would have been a no-brainer. But since returning, the Bengals have given the starter reigns to Jeremy Hill, as well as the red zone carries. I could see them riding whoever the hot hand is against the Steelers…The Phillip Rivers target machine Keenan Allen is finally making the most of his opportunities. 3 touchdowns in his last 2 games (3x his total before then) and coming off an 11 catch 121 performance against Baltimore. The Packers 3rd WR just put up similar numbers against the Patriots and that’s why I like Allen better than Gio this week. For your second conundrum, I like Denard Robinson better and here’s why. While Fred Jackson dispelled the running-back-by-committee approach for the Bills last weekend, he’s running into a buzz saw that is the Broncos run defense. The D-line has found their groove, and allowed Jamaal Charles just 59 yards total (35 rush, 24 rec.). The Bills have a defense that could prevent the Broncos from getting out to a crazy early lead that has forced most teams to give up on the run, but I’m not necessarily counting on it…Shoelace has had a tough go the last two weeks, and it’s mostly been because of game-flow circumstances. The Jaguars had to come back from a 20 point deficit in the first half last week and that helped Marqise Lee out more than Robinson. They should have better luck with time of possession early on against the Texans defense and that bodes well for Robinson, who even got some effective Wildcat plays against the Giants. As I mentioned earlier, Colt McCoy throwing to Jordan Reed only means good things. Tight ends are what makes McCoy tick. If he’s healthy, go with Reed…I really don’t get Larry Donnell. I think some the occasional drop in his numbers is because the Giants OL can’t handle pass rushers without him blocking. He has a solid matchup against the Titans this week though. If Reed can’t go, Donnell will be a decent play in his place. Tony Romo had a tough one last week. He’s dealing with a bad back but seemed to have a weekly routine to rest it. Romo throws 4 touchdowns in Week 12, goes just 3 days without taking a hit, and he has his worst game of the season. A full week with his regular routine against the Bears secondary may be the bounce back Romo needs. He threw 3 touchdowns against Chicago the last time he traveled to Soldier Field and the Bears are allowing 326.4 yards per game to competent quarterbacks (Stafford, Rodgers x2, Brady, Ryan)…Tannehill has good matchup against Baltimore, but Romo will be your guy. Terrance Williams has really fallen off in the last month. He started off hot and then Dez Bryant, Jason Witten, and DeMarco Murray stopped sharing the targets from Romo. Bryant and Witten will benefit the most against the Bears soft press defense this weekend. Malcom Floyd would have been a nice play if he wasn’t going to draw Darrelle Revis or Brandon Browner….I would recommend either Donte Moncrief or Stedman Bailey who I mentioned either, as well as Robert Woods who has emerged as a startable WR thanks to #OrtonMagic and a beat up Sammy Watkins. I’ll be on a work trip in Phoenix till Sunday, but feel free to keep asking questions on either Facebook or Twitter.